Phil, Briony, Jenny, and Spencer flew to New Zealand earlier this afternoon, and Koa and Ryan leave for America tonight. Max and Rosie took the ferry back to Savaii yesterday afternoon. And just like that, Apia, which has been full of volunteers for the past 3 weeks, is nearly empty. Blakey’s up the hill housesitting and I’m here and Erin is supposed to come through town tomorrow. As always, it’s a little weird to see the mass exodus, but mostly it’s a relief. My list of things to do has been steadily growing since school got out, but I figured I’d put it off to hang out with people and trek out to the village and all. So, among other things, my laundry situation has grown dire. Dire. It’s common practice to wear garments 2 or 3 times before washing, depending on the amount of sweat and stink a particular shirt or pair of shorts has taken on, but my clothes have been putting in overtime lately. The first order of business for the day was laundry. I amassed 3 full loads (I don’t remember ever doing 3 full loads in The States), stuffed them into some pillow cases, and called for a taxi. I figure I’d celebrate Christmas early by paying for laundry service. The lady told me to come back around 3:00 p.m.
Apia is all a-bustle with people getting ready for Christmas. I stopped by little Big Bear to get a price check on hangers: 10 frail plastic hangers for $11.90. No way I’m taking that deal. I walked home empty-handed. It was time to mop anyway. I haven’t mopped since I moved in, and after a year in this climate, the floors desperately needed a wash. The screws had rusted on the shoddy mop I bought last year, but with some cajoling I was able to get them loose. I gave the floor a coat of bleach and then a coat of Fabuloso. 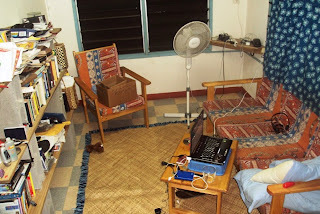 I keep a Samoan fine mat on the floor in my front room, which effectively acts as carpet. The problem is, unlike a carpet, the mat is permeable. I’m pretty good about sweeping the dust from under the edges, but I didn’t realize there was a layer of dust under the whole thing. Gross. I mopped the kitchen and dining areas while I listened to NPR podcasts. It was an enriching and productive day. I picked up my laundry, and caught a taxi to schlep it home. I don’t like the way they fold the shirts, so I had to re-fold, but I have clean clothes now! I hope that today’s momentum of productivity will carry through to tomorrow. I would like to wash the couch cushions and clean the bedroom. That’s a lot to ask for though. I might just watch a movie. 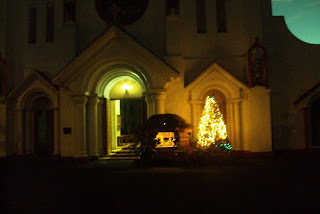 The nativity and Christmas tree outside of the Catholic church in Mulivae. Manuia le Kirisimasi ma le Tausaga Fou Matt. Have a safe holiday. o fea the teine e fai lau tagamea?